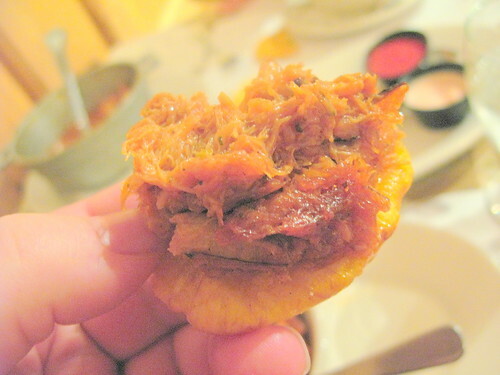 « Jason goes to Puerto Rico: You WILL eat Tostones. And LIKE it. Hola amigos y amigas, it’s Daisy’s buddy Jason Perlow again, and you know what that means — another juicy installment of food in Puerto Rico. In my first post, I talked a bit about the basics of Puerto Rican and Caribbean Latino cuisine, and focused particularly on the platano — the plantain fruit, and tostones, one of the most common but tasty staples you will see while while visiting the island. 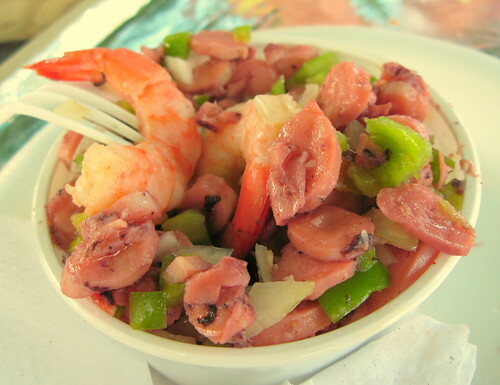 Today, we’re going to talk about seafood — or as Puerto Ricans like to say, MARISCOS! Fisherman’s dock, Las Palmas, Humacao, Puerto Rico. In the States, you don’t normally think of seafood being an integral part of Latino cuisine, but in Puerto Rico, being an island and smack right in the middle of the Caribbean, seafood and shellfish are extremely common and are amongst the most loved things to eat, although much of it unfortunately has to be imported from other countries, such as the Dominican Republic and the Bahamas. 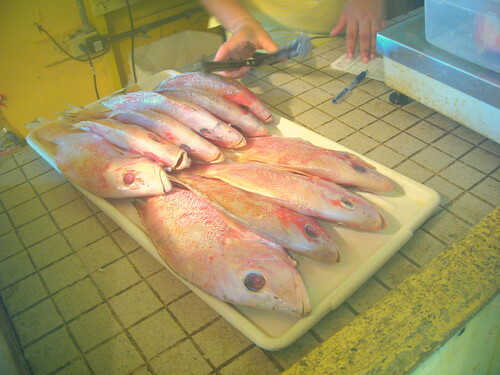 A small amount of fish and other creatures are caught locally, but the Puerto Rican fishing industry is relatively small nowadays. Still, this doesn’t stop a huge amount of the stuff from being consumed on the island itself. Click on the “Continue Reading” link below for more. I’ve found that as a general rule, inebriated people give extremely good restaurant restaurant recommendations in Puerto Rico. “Los Pescadores” near the boat dock in Las Palmas in Humacao. Sure enough, it was indeed a shack, right off the dock where fishermen were bringing in their daily catch. Like I said, not exactly a formal dining room. 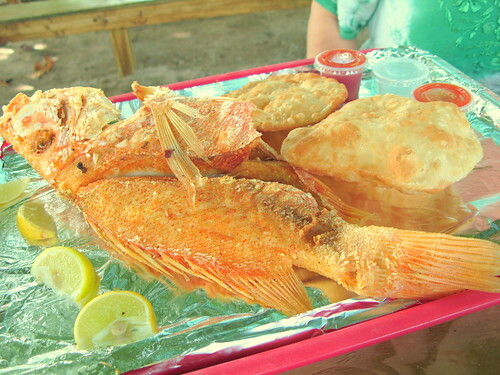 And they did in fact have fresh snapper. Rachel pointed out to one of the smaller ones. 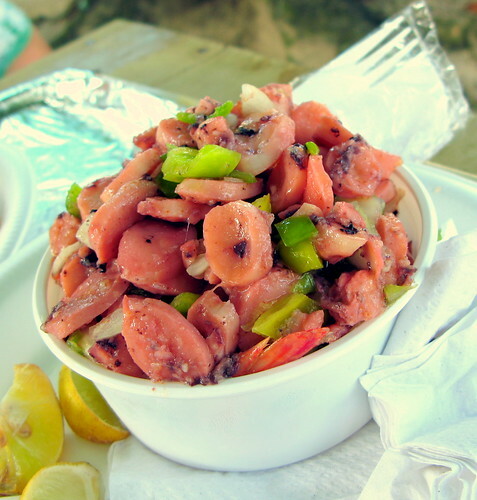 I chose to go with an Ensalada de Pulpo y Camarones (Octopus and Shrimp Salad). You can’t see the shrimp here, they are all buried at the bottom. See, I had to excavate them. 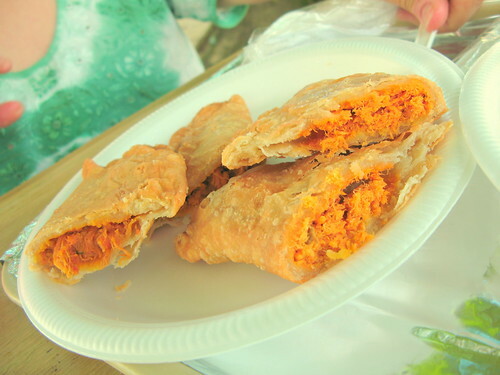 We also got some Empanadas filled with lobster and fish. Here’s how Rachel’s fish came out. The puffy things on the side are Arepas — Johnnycakes, or fried bread. Nice and juicy on the inside. 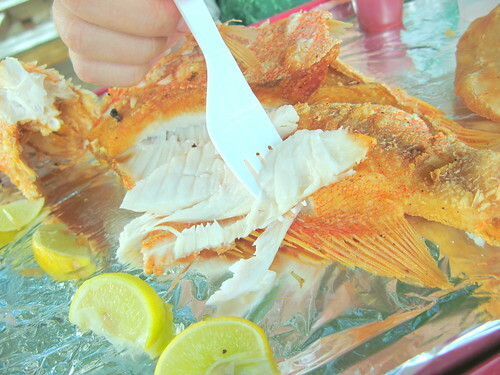 Snapper is indeed one of the most popular fishes on the island, and its one of the few that is caught locally, so if you have the chance to eat it while in Puerto Rico, you definitely should. 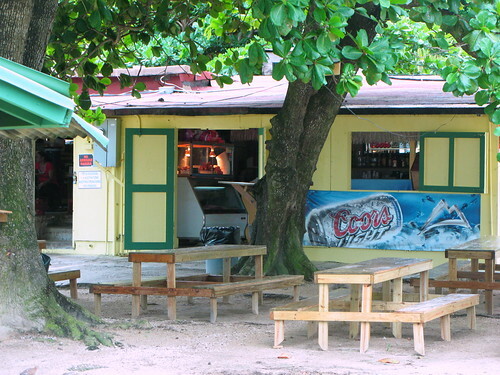 In the tradition of listening to drunk people, we also ended up at Paradise Seafood in Punta Santiago, north of Humacao. Originally we wanted to go to a different restaurant, Trulio’s Seafood, but had discovered that it had recently closed. We were dejected, but a drunk guy at a local hacienda who we stopped on the street told us to head to Paradise, just up the road. 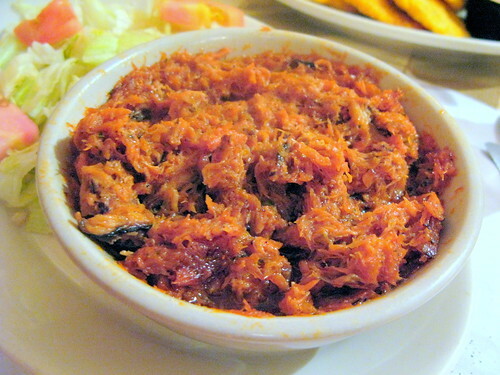 As it turns out, Paradise Seafood is one of the oldest continuously operating restaurants in the Eastern part of Puerto Rico, and probably on the island itself. For 77 years it’s been serving traditional Crilollo seafood dishes, and it set the bar for a lot of our dining experiences on the island. 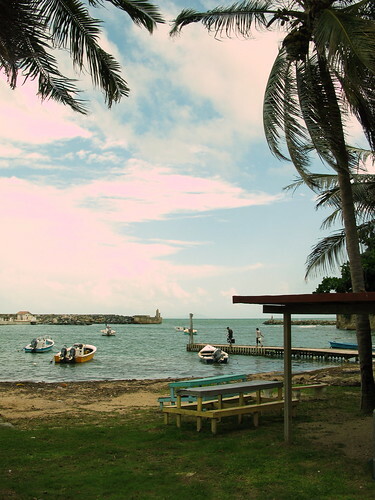 Paradise Seafood, in Punta Santiago. 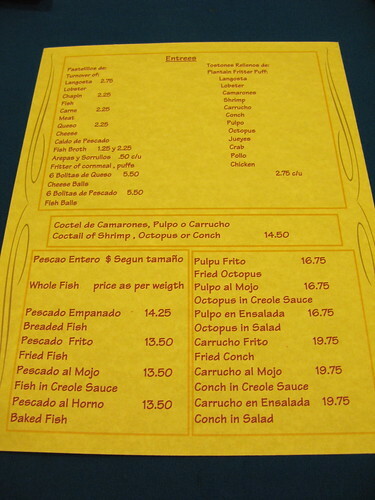 Puerto Rican seafood restaurants all have very similar menus. 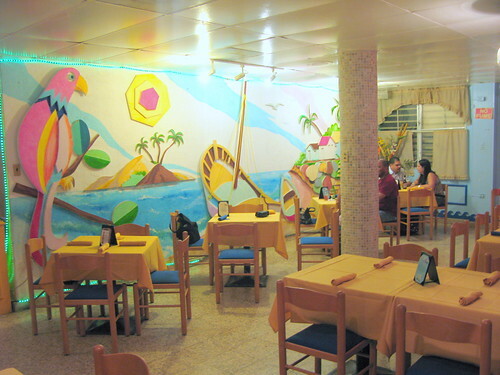 Paradise’s is no exception, but I think its a very good representation of the cuisine. 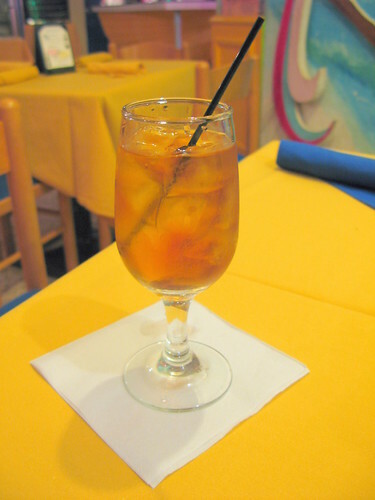 This is my standard drink in Puerto Rico — Ron Del Barrilito on the rocks, or “con rocas”. Edmundo B. Fernandez is the smallest rum producer in Puerto Rico, and its Ron Del Barrilito is considered to be the best rum produced on the island. Puerto Ricans primarily drink it on special occasions because it is a sipping rum that is aged for up to 10 years in the barrel and is not mixed for cocktails. This is “The Good Stuff”. In Puerto Rico, you can buy the “3 Star” for about $20 per bottle, and the “2 Star” for about $16. I brought a few bottles home for gifts. Remember our buddy the plantain? 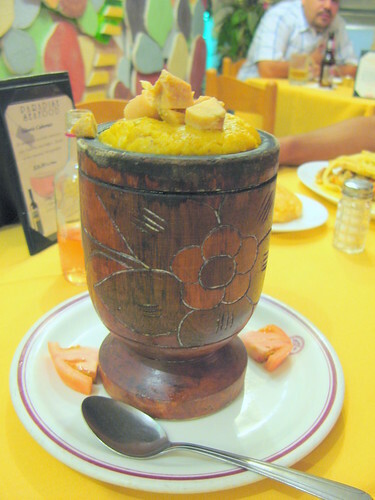 This dish is Mofongo — fried plantains that have been mashed up with a lot of garlic, mixed up with seafood. 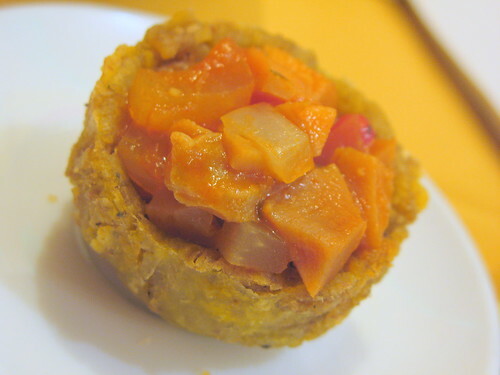 This is a Mofongo de Carrucho — Conch. Another customer ordered this but let me take the picture, I thought the presentation was particularly cool. Toston Relleno appetizer, filled with Conch. 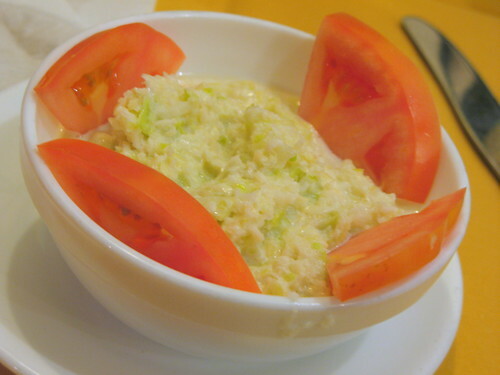 This is what I got that passed for salad, a very sweet coleslaw. As I said in my earlier post, Puerto Ricans really aren’t into veggies. 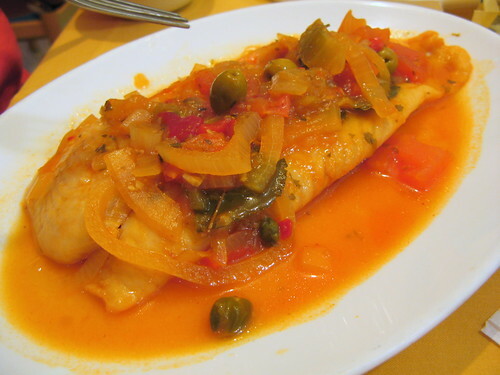 This is snapper in Salsa Criollo, a very traditional fish preparation. 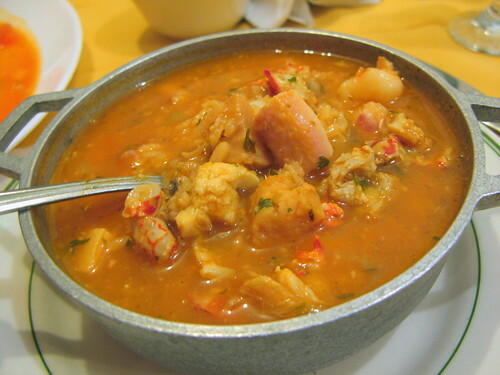 And here is an Asopao de Mariscos, a huge mixed seafood soup with rice containing shrimp, mussels, conch and lobster and crab. 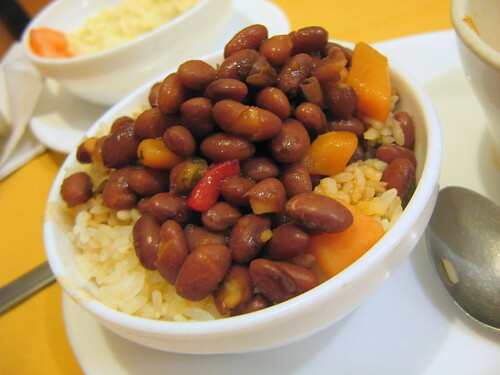 Asopao is also a very common dish in Puerto Rico. Usually its in a tomato based seafood broth. Paradise’s has a very strong garlic flavor, which I like a lot. Here’s a side order of Mofongo that went with my Asopao. 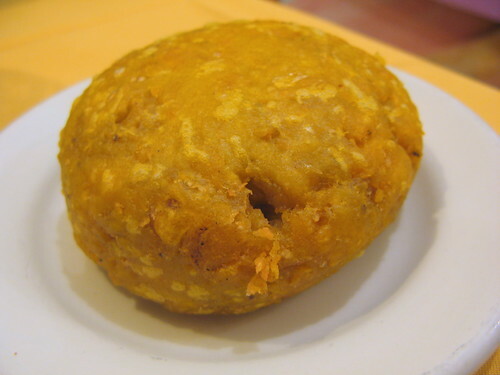 In my opinion this is the best single Mofongo we had in Puerto Rico, it was so well seasoned and very garlicky. Our meal also came with an order of Rice and Beans with Pumpkin (Calabaza). When at Paradise, make room for dessert. 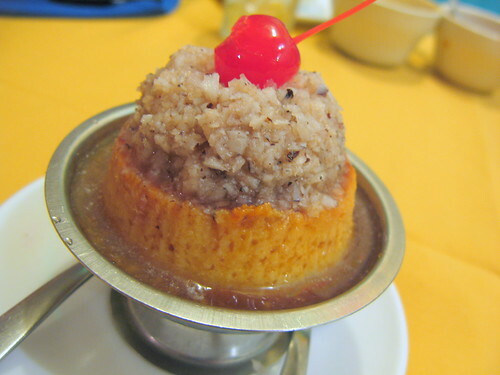 This is their Paradise Special, which is flan doused with Amaretto liqueur topped with candied coconut. By far one of the best flans we had on the island. 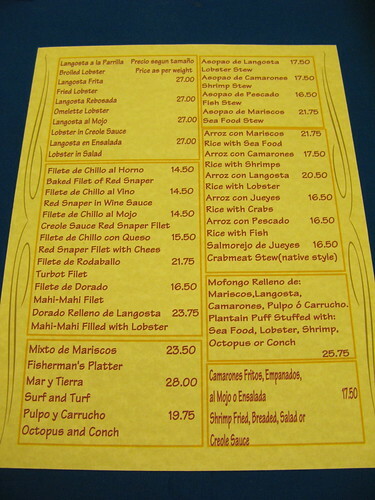 In addition to Paradise Seafood, we also ended up in the city of Salinas, which is on the Southern coast of the Island. 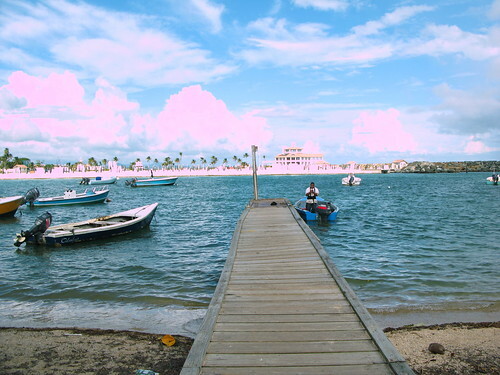 Salinas specifically is known for its seafood dishes, and has many seafood restaurants. 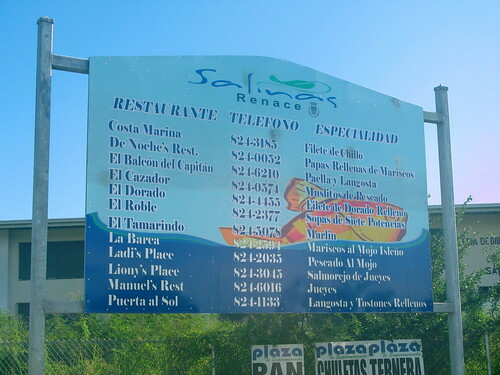 This particular sign as you approach the waterfront in Salinas lists the major restaurants and the specialty of each restaurant. 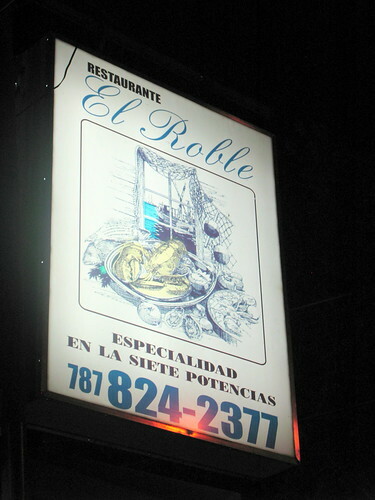 We ended up at El Roble, which specializes in “Siete Potencias”. Being a Jew, I had no idea what exactly “Siete Potencias” was other than the literal meaning in Spanish, which is “Seven Powers”. It sounded like a religious Super Hero squad, like the Superfriends, but in Spanish. Whatever this Siete Potencias was, I had to get me some. First, CERVEZA! 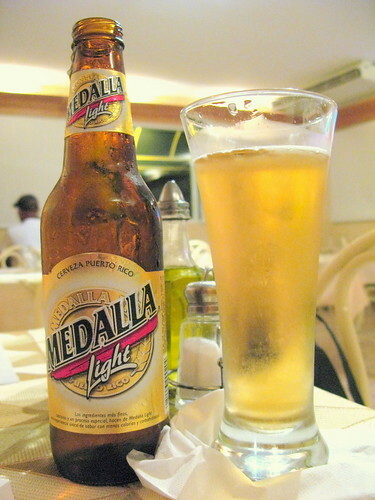 Medalla Light is the most popular beer in Puerto Rico. In fact, it’s actually cheaper than bottled water or Coca-Cola — you can typically find six packs of it for $5.25. Medalla is a light beer, and is perfect for the tropical weather. Like Bud Light, you want to drink this when its ice cold. Rachel started off with a fish soup. 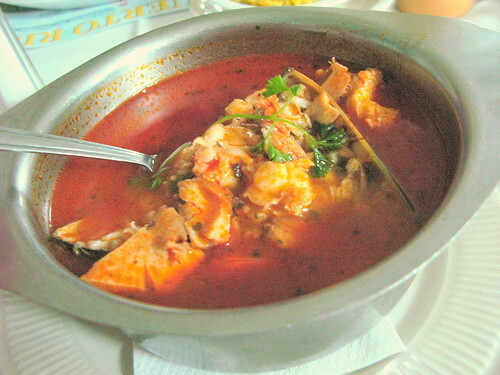 This is a Salmorejo de Jueyes — Crab Stew. 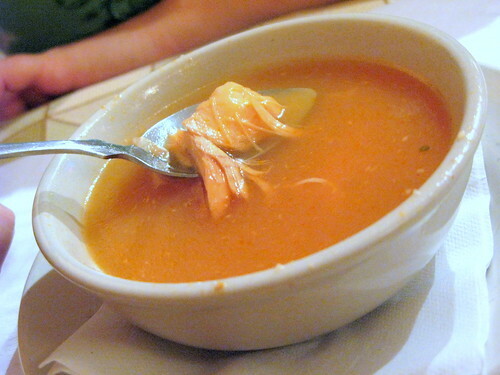 This is essentially 90 percent lump blue crab meat with the Criollo flavoring treatment in tomato broth. UN-FREAKING-BELEIVABLE. I literally couldn’t get enough of this stuff when we were on the island. If they had it, we ordered it. 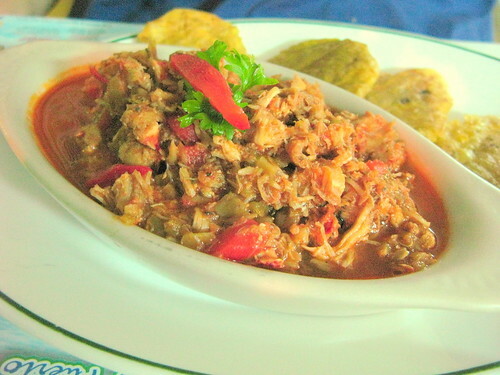 Here is a Salmorejo de Langosta (Lobster) at another restaurant, Rosa’s Seafood, in Fajardo. and what do you eat Salmorejo on? Tostones, of course. 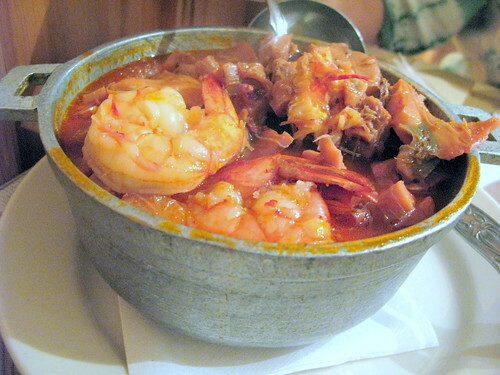 And here is the Siete Potencias, a giant freaking cauldron of seafood. It’s kind of like an Asopao, but it doesn’t have any rice. What it lacks in rice it makes up for in sheer volume of seafood — there’s a ton of Carrucho in this in addition to shrimp and lobster and crab. I’m not sure exactly what the “Seven Powers” are but I’m guessing one of them has a similar effect to Viagra. Just so you can see how generous El Roble’s Siete Potencias is, here is the “Zarzuela de Mariscos” dish at Rosa’s Seafood in Fajardo. I thought it was just ok, and its has nowhere near as much seafood in it as the Siete Potencias or even the Asopao de Mariscos at Paradise. Well, I hope you liked that. See you next post! Wow… now I’m really hungry… I am from Puerto Rico and is nice to see a non-puerto rican guy eat and drink the good stuff. Nice post. I am forwarding this post to anyone I know. Thanks for visiting home. It’s a sad commentary that an island that is so rich is resources, and with such fertile soil, opts to import product from neighboring islands , instead of growing their own. Puerto Ricans, both in the mainland and abroad, need to study this travesty closely, as sak themselves what exactly is at stake here. Cultural identity? Pride? Ownership? The pictures are beautiful as always, Jay, and the post informative. BTW, the “Siete Potencias” translates to the 7 Powers, and refer to the 7 deities in the Yoruba religion of Santeria that have been given the names of 7 Christian saints, so that African slaves could worship their Gods without being prosecuted by the Church. 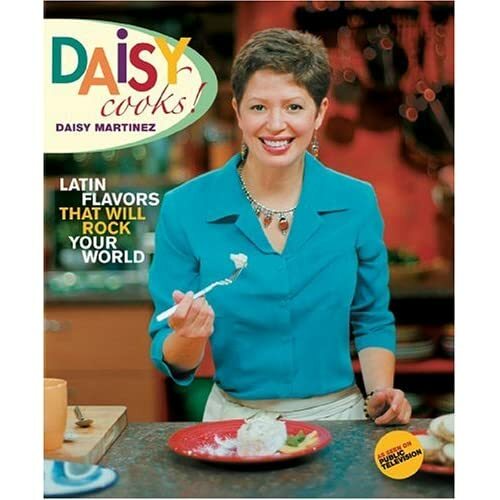 Now I’m off to the kitchen to make some salmorejo and tostones…the weather today CALLS for it! So please go back to my beloved Island– and enjoy the beauty of our countryside! The first two posts are just the beginning — we have a the Mercado De Santurce coming, as well as Guavate, and a few more other things. Next time I plan to spend more time in the actual countryside. As I said in my first post, Puerto Rico is a deceptively big place. With all due respect… no we don’t. Except for lettuce (lechuga), none of the products mentioned before are veggies. They’re either grains, fruits or roots; actually I can’t remember any puertorican dishes that use an actual vegetable as the main ingredient. We do use cabbage for some stews (sancocho is probably the most common), but that’s probably it. And you know what?, I think it’s awesome!! Love our food, love our spice, long live PR criollo cuisine!!! 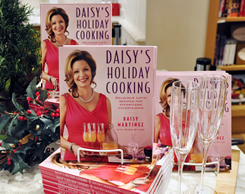 Daisy, looking forward to your new show.